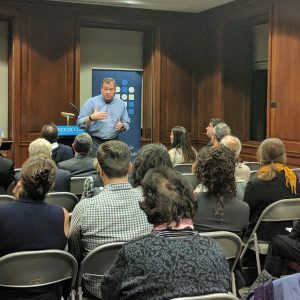 On Thursday, December 1, 2016, the Auschwitz Institute for Peace and Reconciliation (AIPR) co-sponsored an event marking the publication of Dr. James Waller’s latest book, Confronting Evil: Engaging Our Responsibility to Prevent Genocide, alongside the Global Centre for the Responsibility to Protect, New York University’s Liberal Studies and its law school’s Center for Human Rights and Global Justice, as well as the evening’s host, Yeshiva University’s Benjamin N. Cardozo School of Law. The event served as an opportunity for Dr. Waller to talk about the contents and purpose of Confronting Evil and to answer questions from the audience, which included several academics and expert practitioners in atrocity prevention, international justice, and related fields. 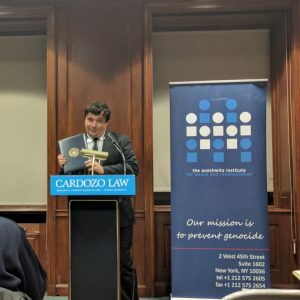 The event began with introductory remarks by Jocelyn Getgen, Telford Taylor Visiting Assistant Clinical Professor of Law at Cardozo Law’s Human Rights and Atrocity Prevention Clinic. Ms. Getgen contextualized the event, discussed the importance of Confronting Evil’s release, and introduced Dr. Waller to attendees. Ms. Getgen was then followed by Dr. Tibi Galis, AIPR’s Executive Director, who introduced the Auschwitz Institute’s mission and programs to the audience and discussed Dr. Waller’s work with the organization since 2008. Dr. Galis highlighted Dr. Waller’s ability to provide unique insight into perpetrator behavior and his proficiency in transforming the outcomes of academic research into viable policy options for prevention. Finally, Dr. Galis surprised Dr. Waller with the presentation of an official Proclamation issued by New York Congressional Representative Charles B. Rangel that honors Dr. Waller for his work on the prevention of genocide and declares December 11, 2016 as “James Waller Day” in the state of New York. In his remarks on Confronting Evil, Dr. Waller led with an emphasis on the importance of preventive work in today’s current political climate. He discussed the significance of his research and the need for proper training for contemporary policymakers in “a world that seems determined to tear itself apart”. He also commented on the need to continue working towards the goal of “Never Again”, which has unfortunately failed to materialize in the modern world. Dr. Waller then discussed his objectives in writing Confronting Evil with the audience. In addition to examining the “Continuum of Prevention Strategies” (upstream, midstream, and downstream prevention), the book deals with the significance of the word “genocide” and the relevant semantic challenges. Dr. Waller explained that his writing was motivated in part by a desire to “reclaim” the word, which has fallen into frequent misuse. He explained that the word was often used with much too expansive of a definition, describing social ills and events that, while horrible, do not represent actual genocide. Equally, he remarked, in policymaking circles, the official definition of the word has often proved to be too restrictive, limiting ambition and political will to drive much needed reforms and action at the international level. Dr. Waller also discussed his views on the loss of “cultural genocide” as a component of the officially recognized concept of genocide, a frustration that he shares with the late Dr. Raphael Lemkin, who was credited with coining the word “genocide” and driving its acceptance on the international scene. He shared with the audience his desire to see the international community “reclaim the notion of cultural genocide”, explaining that “there is more than one way to destroy a people”. Following the conclusion of his remarks and a question and answer session with the event’s attendees, signed copies of Confronting Evil were made available for purchase by attendees. Confronting Evil: Engaging Our Responsibility to Prevent Genocide is available for purchase here from Amazon.com and here from its publisher, Oxford University Press.